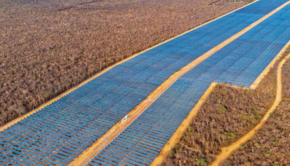 2.7 GW of new solar photovoltaic (PV) will be up for grabs at Brazil’s next renewable energy auction on November 18th, according to the government’s energy ministry. This upcoming auction will be the first time that solar PV has been included in one of the auctions — most previous auctions have been dominated by wind energy. The inclusion of solar PV is something of a surprise, given relatively recent comments from the government in Brazil stating that it didn’t expect solar PV to become a viable option in the country until 2017 or so. That April 2012 statement argued that solar energy was almost twice as expensive as wind. But it appears that there must have been some unexpected developments since then, as solar PV will now been included in the auctions. According to Mauricio Tolmasquim — the president of the government’s Energy Research Company (EPE) — “the ongoing fall in solar panel prices meant it was likely photovoltaic generation would gain more space in the Brazilian energy matrix,” as reported by PV Tech.